The AdVantage Pro freeze dryer with advanced controller from SP Scientific now offers users the benefit of ethernet communication to allow you to monitor your cycle from anywhere that you can receive email. 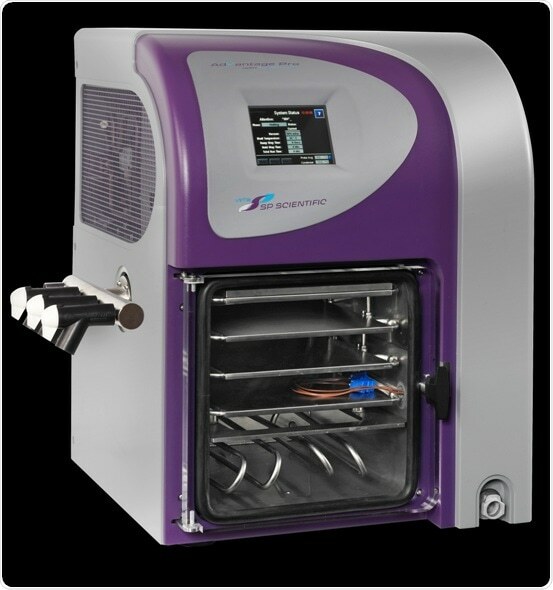 Designed for pharmaceutical and biotech labs, the AdVantage Pro has comparable shelf temperature uniformity (+/- 1.0°C) and system vacuum control performance to larger production freeze dryers, but in a convenient benchtop package. At only 26 in (66 cm) wide, the Advantage Pro requires a minimal amount of your valuable bench space, yet enables product to be safely processed on over 3 ft2 (2,766 cm2) of usable shelf area. The AdVantage Pro offers the versatility to freeze dry bulk product or be configured for applications in stoppered vials. Top-down pneumatic stoppering is available as an option. The Advantage Pro also features a sophisticated and accurate Pirani gauge to measure and control vacuum. Side-mounted manifold valves provide the additional flexibility to freeze dry product in flasks. Two refrigeration choices (-70 °C and -85 °C) are available for the large 6-liter capacity condenser, depending on the type of product and solvents being lyophilized. Your operational convenience is enhanced by an advanced condenser coil which can hold a total of six liters before defrosting. Designed for both the occasional user and freeze-drying expert, the highly intuitive AdVantage Pro controller simplifies freeze drying and makes the system easy to operate. One touch start-up and shut down ensure that your product and freeze dryer are protected from inadvertent operational procedures. Integrated performance and leak testing ensure that your AdVantage Pro is always working optimally. The color touchscreen display provides users with at-a-glance understanding of the status of their freeze dryer and whether or not appropriate freeze-drying conditions exist. Alarm alerts, delivered via email, help notify the user of potential problems with the system and hence, with the product. Recipe customization (up to 10 thermal treatment and 12 drying steps) enables experienced operators to undertake even the most complex freeze-drying protocols. The controller provides scientists with the ability to develop a complete freeze-drying recipe, together with the flexibility to program and control individual pressure and temperature settings at each step of the process.